UPDATE: It is believed this bridge was washed away in a 2011 monsoon storm. The third largest ship breaking yard in the world has created an eerie shipping graveyard in southern Pakistan. In a world of commercial space-flight and super sonic jet flight it can be easy to forget just how hard it can be to traverse certain parts of this planet. But those living in the Gilgit-Baltistan region of Northern Pakistan were cut off from the rest of Pakistan until 1978 due to the mountainous terrain and lack of roads. You could take a small airplane, but that was reserved for only the richest citizens. For everyone else, the only way to travel was by walking across mountain passes to Rawalpindi. In 1978, the Karakoram Highway was completed and the region was connected, but inter-region travel remains as difficult as it was 100 years ago. 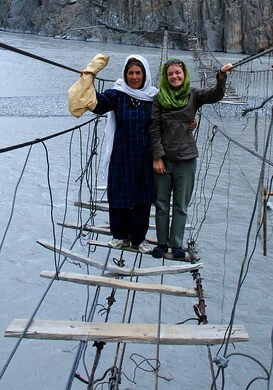 Regular aspects of travel through this region include the rickety cable and plank bridges which cross Northern Pakistan’s mountain streams and rivers. 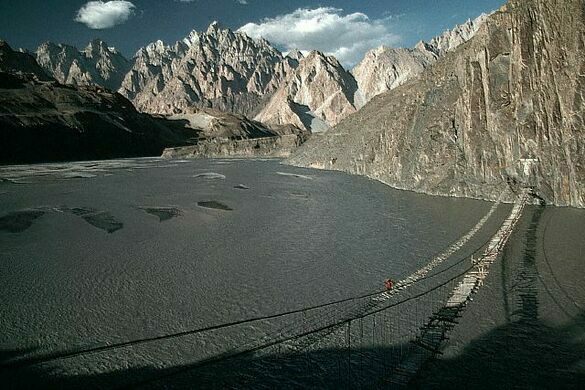 Among these is the Hussaini Hanging Bridge, crossing Borit Lake in the Upper Hunza. This rope bridge is both long and poorly maintained. Many planks are missing, and strong winds shake the bridge as you cross it. It does little to ease nerves that a previous, older, broken bridge hangs in tatters next to the “new” one. 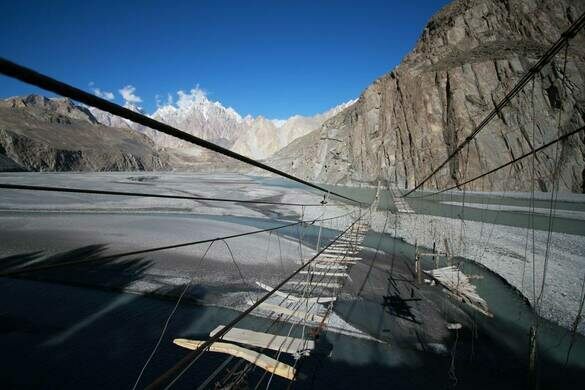 Despite its dangerous looks, however, the Hussaini is is a relatively safe bridge and has become something of a tourist draw, with hikers testing their nerves as they carefully work their way across. Tibetan-influenced mountain fortress in Northern Pakistan. This ancient Silk Road outpost overlooking the Wakhan Valley is miraculously still standing.